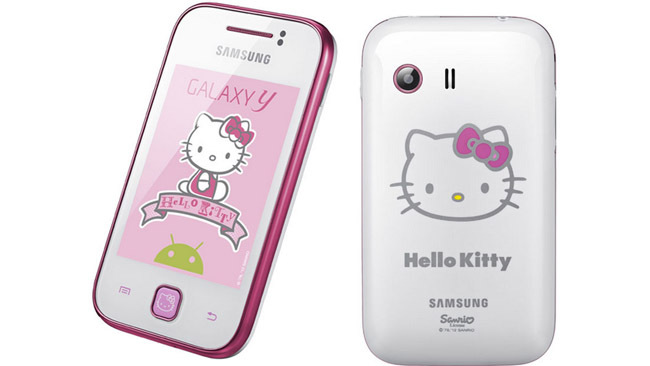 The famous smartphone maker Samsung has unveiled yet another new smartphone – the Galaxy Y Hello Kitty Edition. As the name of the novelty suggests the smartphone targets girls and this is why it comes in pink and features Japanese drawings of cats. Besides the outside looks the Galaxy Y Hello Kitty Edition comes with reworked software that now shows images, sounds and wallpapers in unison with the overall phone appearance. Specs-wise however, the Galaxy Y Hello Kitty Edition does not differ from the original and offers 3G/HSPA, Wi-Fi, GPS, microSD memory card slot and a 2 MP camera. The recommended price of the Samsung Galaxy Y Hello Kitty Edition is 229 EUR.